p38b from other species may also be detectable. 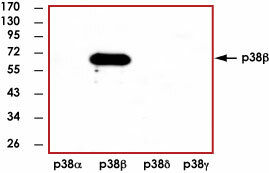 Sample Western Blot :Representative western blot (1:1000) using 20ng of p38α, p38β, p38γ, and p38δ recombinant protein. Scientific Background :p38β is a member of the p38 MAP kinase family and is activated by both proinflammatory cytokines and environmental stress (1). The p38β is activated through its phosphorylation by MAP kinase kinases (MKKs), preferably by MKK6. Transcription factor ATF2/CREB2 has been shown to be a substrate of this kinase (2). Alternatively spliced transcript variants encoding the same protein have been observed. References :1. Jiang, Y. et al: Characterization of the structure and function of a new mitogen-activated protein kinase (p38-beta). J. Biol. Chem. 271: 17920-17926, 1996. 2. Stein, B. et al: p38-2, a novel mitogen-activated protein kinase with distinct properties. J. Biol. Chem. 272: 19509-19517, 1997.